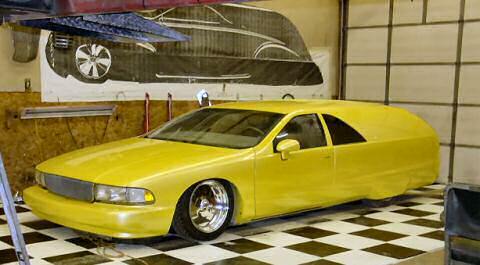 Custom Buick Roadmaster Sedan Delivery for sale from Deco Rides! This car was not sold at Atlantic City Auction Feb 27 due to lack of decent bids. The car is FOR SALE for $10,000. No trades. No bids lower than that will be considered. Engine is a stock 350 V-8 that recently had head removed and resurfaced. Automatic trans was rebuilt. Car starts and runs fine. It has 110,000 miles on it. Full power including windows, seat, door locks and rear hatch. Also has cruise control and air conditioning. Additional customizing: Rear bumper was removed and metal rear pan was rolled. Taillight openings were filled with sheet metal and new single rear custom taillight was fabricated that runs across the back of car beneath the tailgate. License plate depression in tailgate was smoothed with metal and license dropped to center of rolled rear pan. Tailgate still hinges both side and bottom, and opens both ways. Rear window glass still opens. Second bench seat and rear facing seat still function, both fold down flat. Because of chop job, car lacks an interior head liner. Since the car has been my daily driver for the past several years, there are a few small cracks appearing in the body, but for the price this will sell for (about 1/3 of what I've got in it) it is still a bargain. Leather-like vinyl upholstery on seats, door panels, etc. in original light brown color is cracking and shows wear, with several small rips or holes in upholstery (front seats). Rear door on driver's side of car was welded shut and smoothed in, rear door on passenger's side still opens (interior handle only on rear door) so passengers can get in and out of second bench seat. Air Ride Technologies air bag system is used on front and rear of car and drops or raises it 4 inches with the touch of a switch on the dashboard. Air Ride system was $1,500, not counting installation. Car comes with stock wheels and tires. Car looks great with fender skirts on or off for open rear wheel wells. Metal fender skirts were fabricated from scratch and bolt on and off. Leading edge of hood was extended down for smoother look and top inch of Buick grille was removed. Moon fiberglass smoothie Caprice front bumper replaced original Buick bumper for cleaner look. Painted screaming PPG Flamboyance yellow (five stages including diamond flakes)with airbrushed simulated chrome strip that runs around the car. Paint prep, paint materials, paint job and airbrushing alone cost approximately $10,000. I have close to $30,000 invested in building this car. There is a rattle in the back I have not tracked down yet. For this price, don't whine about it. The B-pillar and area forwards of mirror painted gloss black to produce stylized black side window effect. The engine problems and tape player maladies previously mentioned on this page have all been repaired. Rubber welting on top of driver's window needs to be repaired/replaced as it got scrunched by the power window. A reliable driver. Starts right up. New alternator, front brakes and battery. Nice exhaust note due to glass-packed mufflers. Starts, runs, steers, stops and drives fine. AC/heater, wipers, lights, etc. all work well. Garaged. One very slow leak in air ride system. Oil changed regularly. This car draws a crowd when parked, lots of "thumbs up" by passing cars when rolling. Would make a great "shop truck", just paint or adhesive vinyl your company logo on upper rear quarter and center of decklid and you will get people's attention.